We are now days before your journey and adventure to the Indian Ocean. I will be sending each of you a confirmation voucher. This will reflect your Unit numbers. This is please to be printed and presented at reception on arrival. Thank you for all the transfer time confirmations sent. please let me know if you are still unsure of this. IF taking your own car across the border, please see border car regulations doc above. PLEASE: Once at the border, you need to ensure you have ALL passports stamped on BOTH sides of the border – SA and MOZ. Please also take a look into the passport. Make sure you actually see the stamps. All children under 18 to have ALL official letters and Un-Abridged Birth certificates. You are welcome, if border not too busy to ask officials if you may drive car over to MOZ side and unload there onto the transfer cars; then one of you to take your car back to SA side. And park and sign car in to lock up. It is 5 min walk back to border. All foods are best packed into plastic crates – this is both monkey and bush baby safe once on site. I am available on my MOZ number – SMS is best !! 00258844554319 and WhatsApp works very well on SA number 073 544 1485. The journey is a part of your adventure. Take it easy.. enjoy the scenery. Take some pictures. It is a lovely part of the country you will pass through. I look so forward to sharing this special time with you all. What are your diving rates? 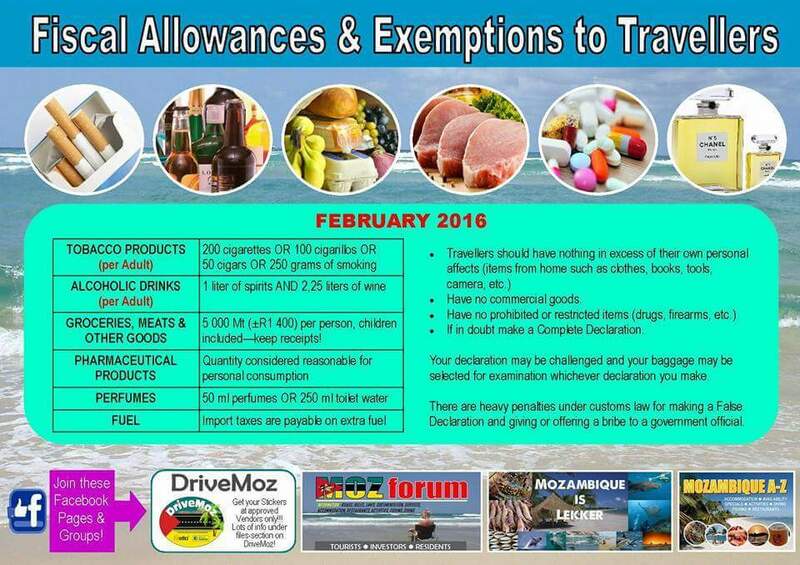 R 100.00 : COMPULSORY Reef tax for the week. What are the vehicle requirements to cross the border? It is also a GREAT idea to fill up your car at the last petrol stop : The TOTAL garage in Manguzi / Kosi Bay. Please have your car registration papers ready. These MUST be original and CERTIFIED by the commissioner of oaths forms. These state the VIN number or chassis number and the engine number. The license disc on the car windscreen also reflects these numbers. Once through police check, have your passport and drivers license card ready. On Mozambique side of border, to your left is a small immigration building. Here you will fill in the car import paper work. Proceed then to one of the insurance huts it will be R250 for 3rd party insurance which you are obliged to take. The South African Police Service (SAPS) has implemented new regulations that require drivers of cars with South African-registered plates to carry certified documents proving ownership. This new requirement will be implemented at all South African border posts, according to Vishnu Naidoo, SAPS head: Media Communications. A certified copy of vehicle registration/vehicle license papers which must be presented at the border posts. A letter from the bank giving authorisation to take the vehicle across the border and must indicate dates of travel. Both the bank letter and license papers should be signed by a Commissioner of Oaths. An affidavit from the police giving authorisation from the financial institution/owner to take the vehicle abroad is required. The driver must have a letter from the rental company giving permission to take the vehicle out of the country. Regulations do change, and a customs officer advises SA travellers to check with the SA Auto Club on border regulation updates. PLEASE BE SURE TO STAMP YOUR PASSPORT ON BOTH SIDES OF THE BORDER..MOZ AND SA !! What are the border transfer times? If you wish to bring your own 4×4 across the border.. please let us know.. so we are able to send relevant info regards this. 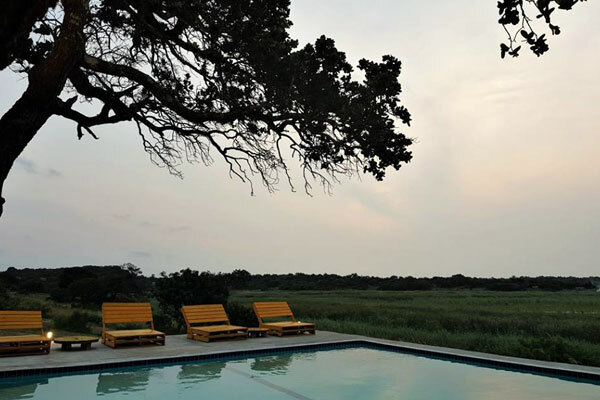 We often suggest to guests to take a relaxed drive to Pongola on the previous day, Which is about 5 hours from Johannesburg or Pretoria…overnight here on route… we will suggest a great B&B …then take the easy 2 and a half hour drive to border early the next morning. Thus able to meet the 10 am transfer.. Please let us know ASAP if you want this option. OR drive through the night, Leaving Jhb at 12pm ..to make the border by 8am ..its opening time .. this is if you are bringing your own car over the border. PLEASE let us know what you decide regards the above so I am able to plan your transfer times accordingly. PLEASE: Once at the border.. You need to ensure you have ALL passports ready to be stamped on BOTH sides of the border.. SA and MOZAMBIQUE. Please once stamped take a look at stamped pages of the passport. Make sure you actually see the stamps and that are dated correctly. All children under 18 to have ALL official letters and UN Abridged Birth certificates. If you have pre-arranged a border transfer you are welcome, if border not too busy, to ask the SA officials if you may drive your car over to MOZ side and unload luggage directly onto the transfer vehicles, then only the driver need take your car back to SA side. And park and sign car in to lock up… it is 5 min walk back to border.. The border officials on MOZ side do get sticky about the amount of alcohol and meat brought over the border.. THUS please do not pack more than the suggested amount. PLEASE BE SURE TO STAMP YOUR PASSPORT ON BOTH SIDES OF THE BORDER..MOZ AND SA! Halo Gaia is simply assisting with the management of this service for a local self-employed family. It is therefore important you please provide ALL the below details – at the time of your booking. PLEASE keep in contact with COURTNEY via WhatsApp +27 73 544 1485. Respectfully – The WhatsApp option is NOT for last minute planning – as ALL your necessary info is on this document and would have been sent in EMAIL correspondence. There is a shopping centre in Ballito to buy supplies, along with a bottle store. Please be sure to have a good road map in hand in conjunction with these directions! Travel through the town of Mangusi, this road will take you to the Farazela or Kosi Bay border. Time wise it is about 4.5 hours – 5 hours depending on stops from King Shaka Airport to the Border. Plus minus another 1 hour from the border to Halo Gaia Camp in 4×4 pick up. IF you are running late please contact (call but best SMS) Courtney in Mozambique 00258 844 55 4319 who will call ahead for you. BUT you run the risk of waiting at the border for a long while for another transfer if you miss your booked transfer! You will be charged a R50 penalty should you miss your border transfers another vehicle needs to be sent to collect you, generally the pick up will allow for ½ hour grace time. JHB N17 HIGHWAY TO Springs. Highway will take you all the way to ERMELO. This is a TOLL Road. In ERMELO look for the N2 TO PIET RETIEF. FROM THE N2, GO THROUGH PONGOLA. FROM PONGOLA, 47 KM’S TURN LEFT TO JOZINI DAM. AT JOZINI, TAKE THE LEFT FORK TO KOSI BAY AND NOT TO SODWANA BAY. GO OVER DAM WALL. There are small potholes on this road. AT T-JUNCTION TURN RIGHT TO TRAVEL FURTHER TO KOSI BAY. KEEP STRAIGHT TOWARDS THE BORDER. WE WILL COLLECT YOU AT THE BORDER WITH 4X4 – PLEASE PARK YOUR VEHICLE ON THE “SA” SIDE AT PARKING AREA AND WAIT ON THE MOZAMBIQUE SIDE FOR US. If the border is particularly busy due to a peak season time, do not, if you are not taking your own car over the border but awaiting a transfer, wait in the long queue of cars – drive as close as you can to gates, even if this means to drive on the verge unpack bags. Wait with bags while one of you goes to park your car in lock up. Walk bags over the border, this will save you a lot of time. NB: RETURN JOURNEY Mark 85km from leaving the border to turn off. PLEASE TURN LEFT ONTO THE ROAD TO JOZINI. Look for the following road marks as the sign posting is very poor. THIS IS AT THE same T-JUNCTION INTERSECTION: WHEN YOU originally travelled from JOSINI TO KOSI BAY. PLEASE BE EXCEPTIONALY ALERT FOR LIVE STOCK ANIMALS, COWS & GOATS ON THE ROAD ESPECIALLY ONCE YOU REACH PIET RETIEF, PONGOLA & JOZINI. Please be sure to have a good road map in hand in conjunction with these written directions. And most importantly In~joy the journey & safe travel. We usually do this in last town MANGUZI – 15 to 20 km from the border you are then able to take a SLOW drive to the border and not need deflate at the border.. PLEASE also Fill your car with fuel at this station / fuel is more costly in Mozambique and keep in contact with Courtney on route via SMS -+ 258 844 55 4319 or WhatsApp + 27 73 544 1485. We will thus know when you are at the border and when to expect you in camp. Once at the border IMPORTANT TO MAKE sure you stamp your passports on both the SA and Moz sides of border PLEASE ensure to CHECK THE STAMPS. Once through the 2nd border gates, you will note the NEW tarred road. This Road will take you to Maputo and Ponta Do Oura ONLY. Ponta Malongane will still require 4×4 access. Take the tarred road – until you get to the first traffic circle. Take the First exit OUT of circle – turning LEFT. Continue the tarred road for a few km until you see a very small inconspicuous sign. PONTA MALONGANE – Turn LEFT here – NOW onto the sandy tracks. Best advice is to stick with middle roads. There are many tracks; it seems confusing, but embrace the adventure! AVOID any extreme left or right turns. Signs are not great but follow the intermittent blue and white signs that say Ponta Malongane / Wakene. Journey to camp can take as much as 40 min. You will pass a small school on left and then approach an inland lake – Lake Sugi. Follow the road around the lake into the Malongane Village. Once in Village pass craft markets on your right and follow road past Tartaruga gate and road will take you right to the reception gates of PARQUE DE MALONGANE. Here at reception.. present your printed confirmation vouchers. I will send this to you separately. Optional extra – But we do recommend it – An affidavit by both parents / reflecting dates of travel / certified. BOTH above letters – are to state dates of travel / Arrival & Departure dates. If a Parent has passed away – A death certificate should be included. If a parent has never been present in the life of the child – an exemption letter can be acquired at the Home Affairs office – They do even offer an UNABRIDGED birth certificate without the name of absent life parent . We would suggest you fill your car in Kosi Bay/Manguzi before entering the border. Ponta do Ouro has a gas station, but their fuel is very expensive. Southern Mozambique is a very low risk malaria area, we do advise you to consult your physician. There is a clinic in Ponta Do Ouro and a hospital in Manguzi, the last town on the SA side. There is also a lovely efficient local pharmacy in Ponta do Ouro. South African Passport holders don’t need a Visa! Foreign passport holders can obtain their Visa at the border and the cost is +- R 890.00 , if you prefer to get your Visa before arriving in Mozambique you may go visit your closest Mozambique Consulate. Alcohol : You may bring in 1 ltrs Spirits and 2.25 ltrs of wine. ATM – You can draw money in Ponta do Ouro, but you will receive cash in meticais. Kosi Bay border post and Ponta de Ouro is 10kms from the border. Car Lock-up area for those that don’t have 4×4 and using a border transfer – Available on the South African side of the border @ about R50.00 per day per vehicle. All vehicles are under 24-hour guard. Approx. 7-8 hours from Gauteng. Approx. 5-6 hours from Durban. The local currency is meticais and generally they work on an exchange rate of R1 = 3meticais / 3.5meticais. Rands are however accepted at all shops and restaurants. Ponta Do Ouro has a local bank. Ponta Do Ouro has a bank, bottle store, pharmacy, surf shops, fishing tackle shop, butchery, hardware store, petrol station, internet cafe, supermarket, (limited) craft and curio market and a colourful food market where you can buy fruit and veg grown locally, alcohol, cigarettes, airtime, prawns, cashews, bread, etc. There are numerous dive sites and coral reefs. This is a tourist destination to please any person interested in scuba diving, deep sea fishing, snorkelling, swimming on white sand beaches. Both Ponta Malongane as well as Ponta Do ouro offer diving experiences with qualified Dive Centres, we recommend Gozo-Azul. 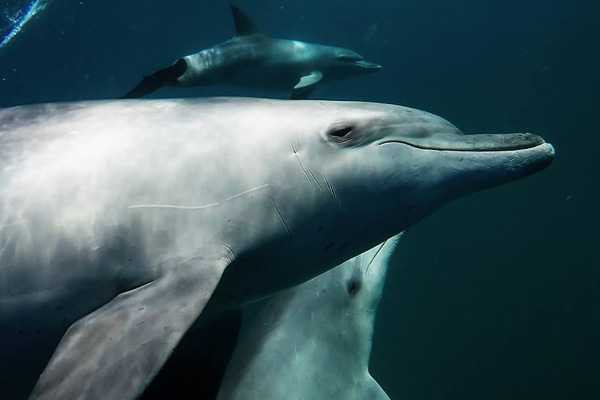 Swimming with the Dolphins is one of the major attractions of this area, we recommend the Dolphin Research Centre in Ponta D’oura. Surf fishing is good from the beach and local Deep Sea fishing Companies offer stunning fishing opportunities and can be arranged. Turtles lay their eggs between Nov and February on our beaches which you can witness if you take a calm stroll on the beach after dark. The hatchlings make their way to the ocean from Jan-March. Please never disturb the when they come out to lay eggs and refrain from touching them / their hatchlings at all times. Humpback and Southern Right Whale sightings are magnificent from July to Nov. Pods of dolphins can been seen all year round. Quad bikes, surf boards and kite surf boards can be hired, and lessons are available in Ponta Do Ouro. About Ponta do Ouro (Point of Gold):There are many different stories as to the origin of the name, from a sunken ship carrying gold bars, to a beautiful golden sunrise. The historical truth might never be known, but the modern day value of what is one of the most beautiful and unspoiled bays in the world, can certainly lay claim to golden treasures.Ponta do Oura consists of few accommodation resorts, private houses, a Petrol Station (Petrol/Diesel), a local market and curio centre, local pubs/restaurants and the main campsite overlooking the boat launch beach.If you do bring meat along, it must be vacuum packed. Bring all groceries with you, including long life milk. Fresh bread is available every day. The months from November to April are characterised by warm temperatures accompanied by relatively high humidity levels whereas the winter months are moderate to warm with much lower levels of humidity. The warm waters of the “Mozambique Current” flow southwards from Madagascar to within 10 Kms of the coastline. 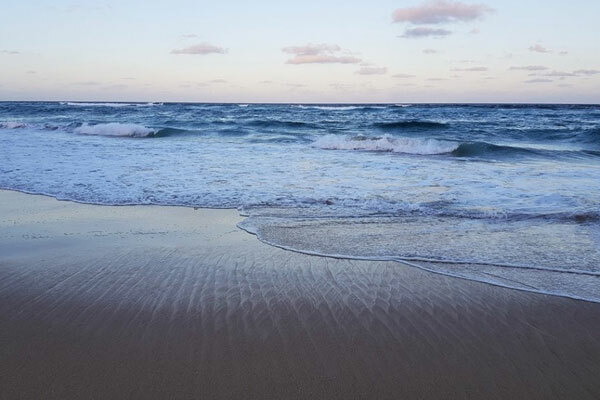 The sea temperature generally tracks the land temperature and will go up to 28 degrees in the summer months and down to 21 degrees C in the winter months. 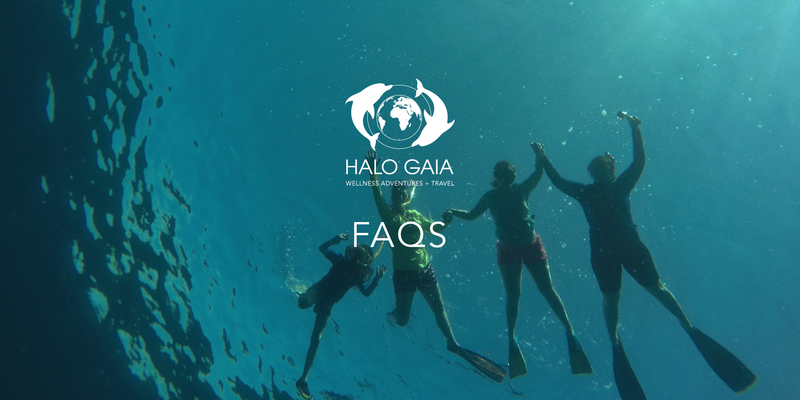 This is an ideal ecosystem for the vast number of species of game and reef fish, dolphins, whales and turtles that traverse this area as well as for all of the other activities suited to an “all year round” warm water location.